May 24 Another lazy morning left us on another afternoon start. 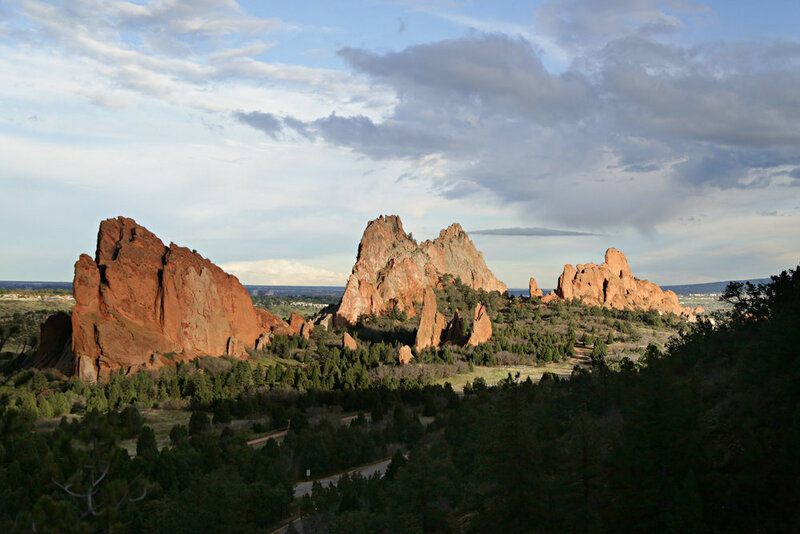 We headed to Garden of the Gods, one of the most anticipated stops of the trip. We were in good spirits since we only had 4 hours we'd need to be in a car. What a delight to be able to relax! We arrived at 7:00 pm and headed for the Visitor's Center, as is our habit. They gave us trail options for hiking, so we trekked around for a couple hours. We took the upper trail then walked among the rocks. We watched the sunset and saw our third rainbow in a row. It was stunning. Sunset, a rainbow, and some of the most beautiful rock formations I've seen... Does life get better than this? We climbed up the rocks and took pictures atop them before sheepishly, in exhaustion, headed to the Marriott. We planned to head to Denver and Boulder the next morning. Happily, we ate bowls of ice cream, delighting in our situation, comfy in warm beds.